"There was a bloke called Bruce Jackson from Sydney who was a genius. He grew up in Vaucluse and in the late sixties started getting into sound. In about 1971, when he was just 22, he became the sound engineer for Elvis Presley"
"Bruce should be a household name in Sydney. I think he is an absolute legend. He revolutionised Elvis Presley's sound. He was the first person to put the speakers up off the ground, and fly them from scaffolding. He did a whole lot of stuff for Elvis Presley. Elvis absolutely adored him. And then after Elvis died in 1977, this bloke became Bruce Springsteen's front of house guy. A lot of the sound and techniques in common use today come from elements that Bruce developed". 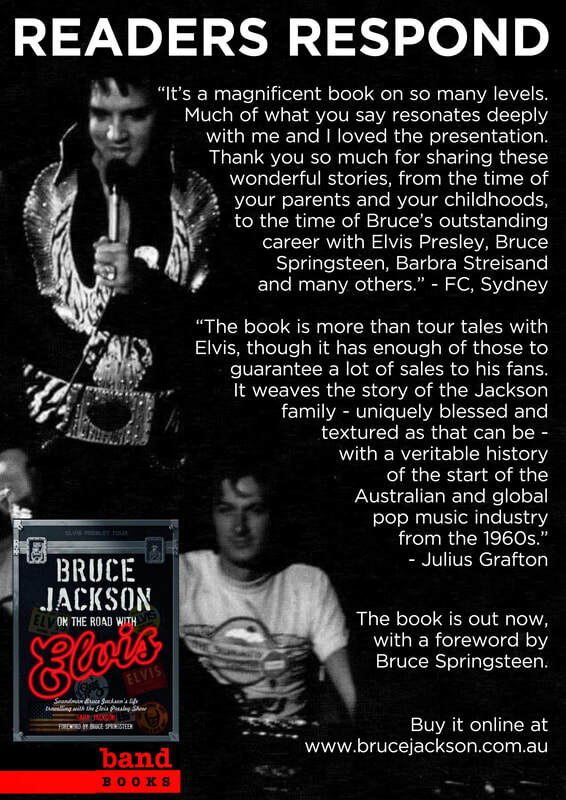 Sydney boy Bruce Jackson was Elvis Presley's soundman on tour for six years from 1971 until Elvis's death on August 16 1977. 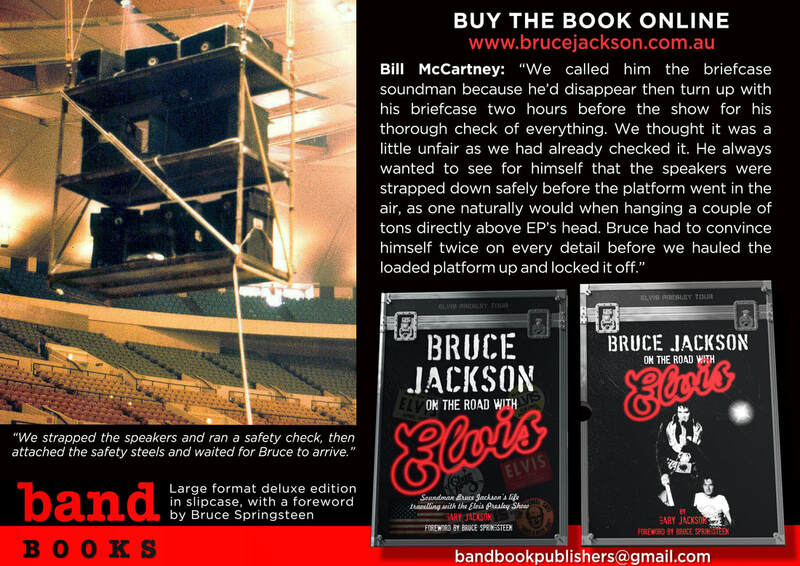 Bruce Jackson then worked for Bruce Springsteen on tour for more than ten years. In 1988 Bruce quit touring to build a new company APOGEE. Following an 'offer he couldn't refuse' from Barbra Streisand's manager Marty Erlichman, Bruce was pivotal in coaxing Barbra Streisand back onto the stage after a 27 year absence, for which he won an Emmy. Along the way he also toured with most of the biggest names in the business at the top of their game, including The Jackson Five; Blood, Sweat and Tears; Glen Campbell; Johnny Cash; Rod Stewart; Carly Simon; James Taylor; Fleetwood Mac; Stevie Nicks; The Rev Al Green; Art Garfunkel; Cat Stevens; Black Sabbath and many more. He was also Director Of Sound for the Sydney Olympics, redesigned the in-house sound for the Sydney Opera House and the Hollywood Bowl. Bruce's numerous inventions and technical innovations changed forever the way concert sound is heard, as some of your students with industry experience will be aware. Bruce died piloting his own plane in Death Valley, California, in 2011. He left behind a trove of letters, audio tapes and memorabilia. My partner Helen and I have used these artefacts to painstakingly author this work. The story is told in my voice as his younger brother. Feedback from a customer in Gymea, Sydney: "Love the book but at 2kg it's too heavy to read in bed." Click on image to see the interview. We had an opportunity to talk about the book live on national television on the CBS TEN Network's Studio 10 morning program in Sydney. Click on image to play video. Hear Elvis sing 'Happy Birthday' to Bruce. ​in close communication with Elvis. Click on image to play video. 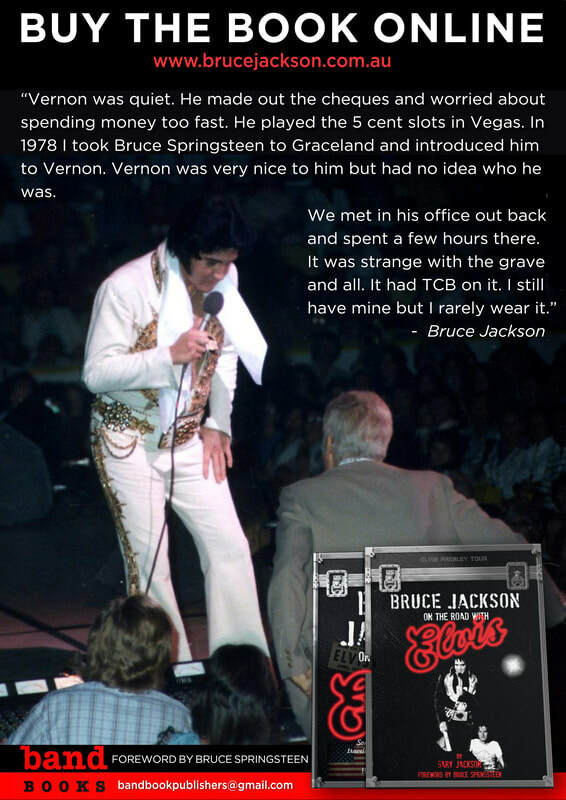 Hear Bruce describe getting his TCB pin from Elvis. 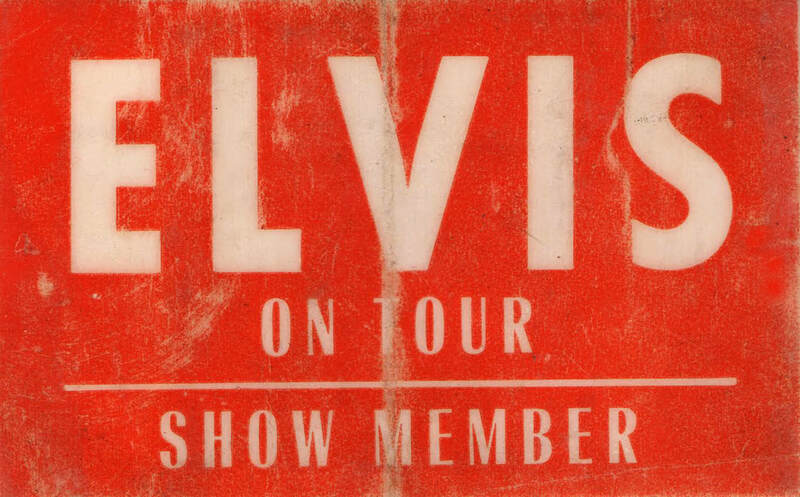 Bruce Jackson was Elvis Presley's touring soundman for six years. On July 5, 1976, in Memphis at the end of a tour, Elvis gave Bruce a gold TCB necklace and welcomed him to the inner circle, adding that it was long overdue. Bruce was killed flying his own plane in Death Valley, California in 2011. 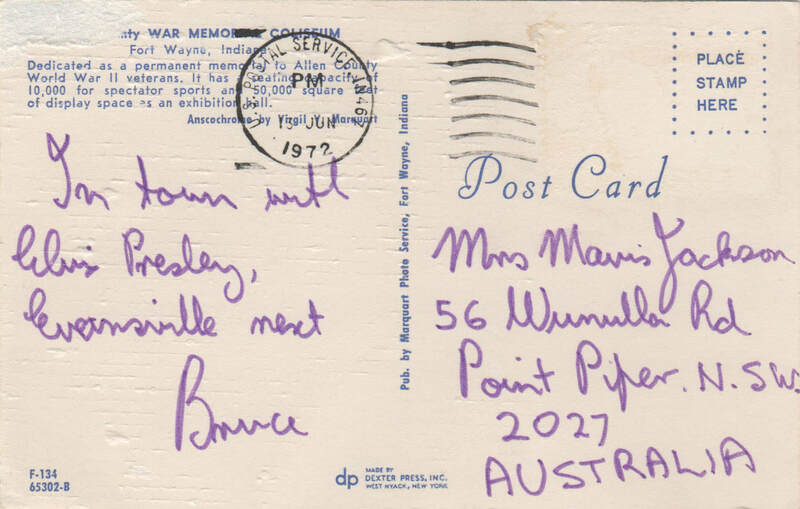 He was a keen collector of memorabilia and left a haunting day to day record of his life on the road in postcards, letters and talking tapes. I've used them plus interviews with his colleagues and my own experience as his younger brother to write a fitting tribute to both men. 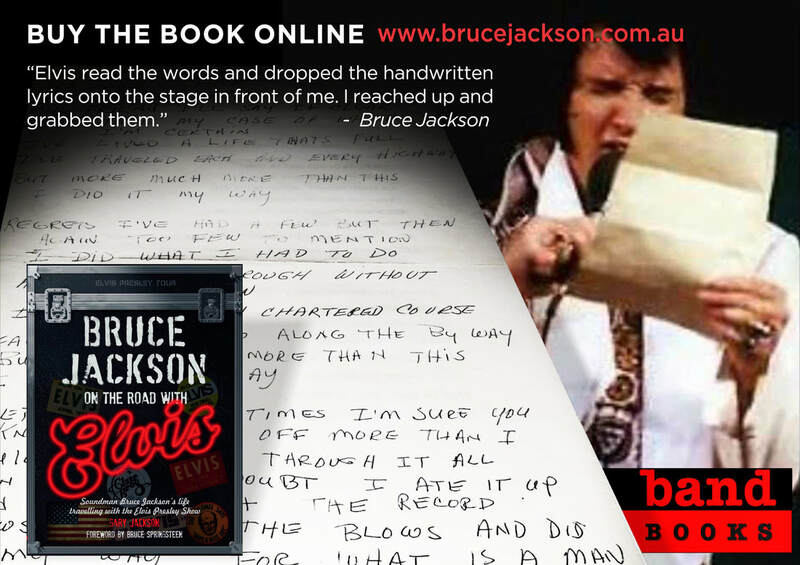 The book delivers an intimate, engaging narrative of Bruce's extraordinary life, up close with the world's top performer. 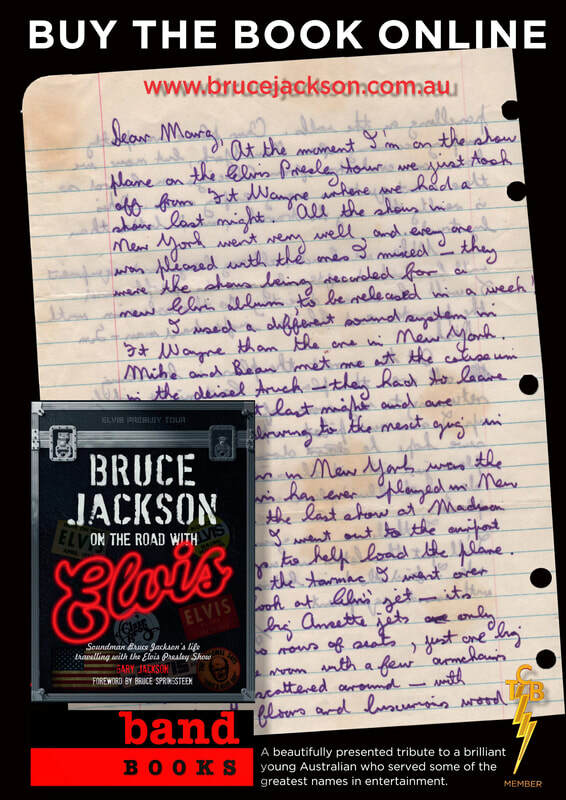 After Elvis died, Elvis-fan Bruce Springsteen hired Bruce Jackson, saying "I've got Elvis's guy...Elvis's man is working for me in the house." "Bruce Jackson was the sound guy from central casting. Tall, good looking, and Australian. He knew more about audio electronics than anyone I ever met. He made his clients sound their best, and then some. He had a mastery of live audio that is impossible to explain. Bruce spoke to Elvis like a normal person. He gave the mega-star the reassurance he needed before a show." - Julius Grafton, publisher CX Magazine, the trade journal for the live audio and lighting industry in Australia. Years of work have gone into making this book a fitting tribute. Bruce's first person narrative and contributions by friends and colleagues plus the eye-witness perspective of his brother Gary come together for an extraordinary insight. This is, incredibly, a new look at Elvis by someone who worked with him in a professional relationship that evolved into a personal friendship. 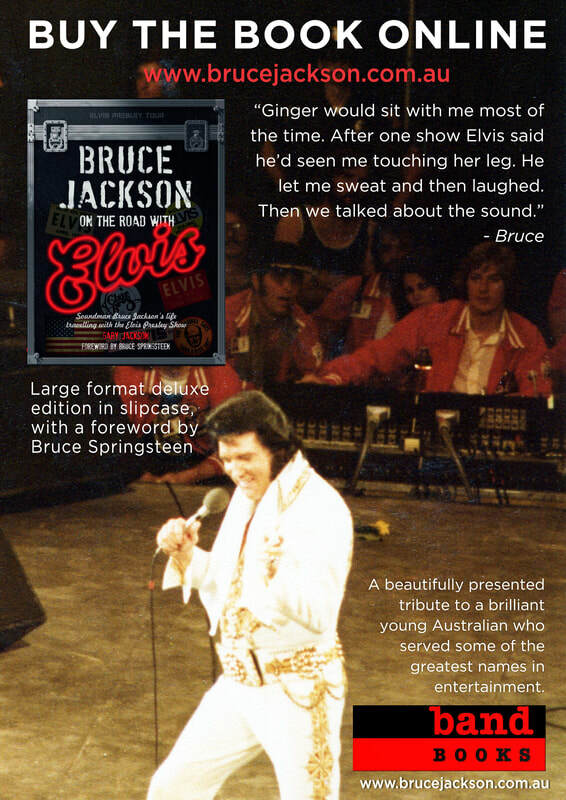 Elvis came to respect Bruce Jackson as much as Bruce respected Elvis Presley. 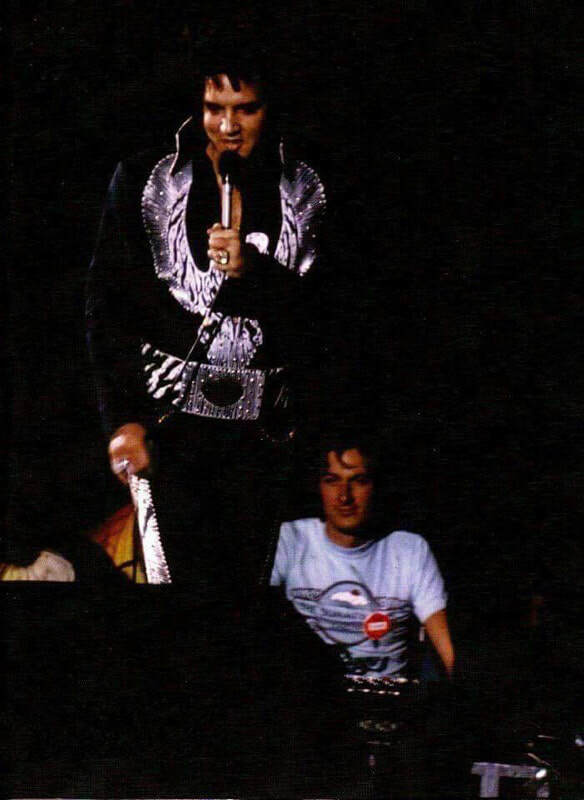 the road, so close to Elvis that he could talk to Bruce during the concert, and he often did. "This is a book about a brilliant, flawed and fascinating human who served some of the greatest names in entertainment. Bruce lived as a teenager in one of Sydney's most opulent harbour-side mansions, yet he was just like a common man. He died in an unexplained accident while piloting his beloved Mooney single engine airplane in Death Valley, California. ​“When I first met Bruce Jackson I only knew two things about him. I knew that he had worked for Elvis, which I thought was great, and that he was Australian. I don't think I knew any Australians and we started working together and he did the sound and I learned very early on that Australians are unique. ​Seems a lot of people dug the Dirt Music radio show on 2SER this afternoon. 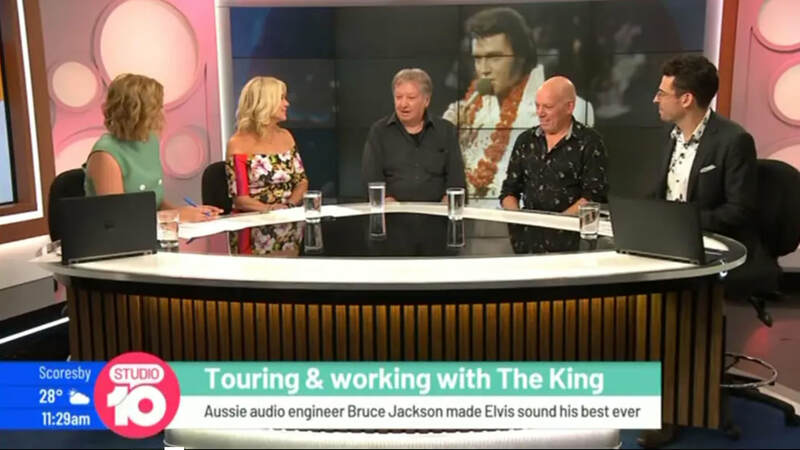 The first hour was a look at the career of Australian sound engineer Bruce Jackson who worked with Elvis Presley and Bruce Springsteen amongst others. Joining me in the studio was his brother Gary Jackson who has written and assembled an amazing book on Bruce's life and career. 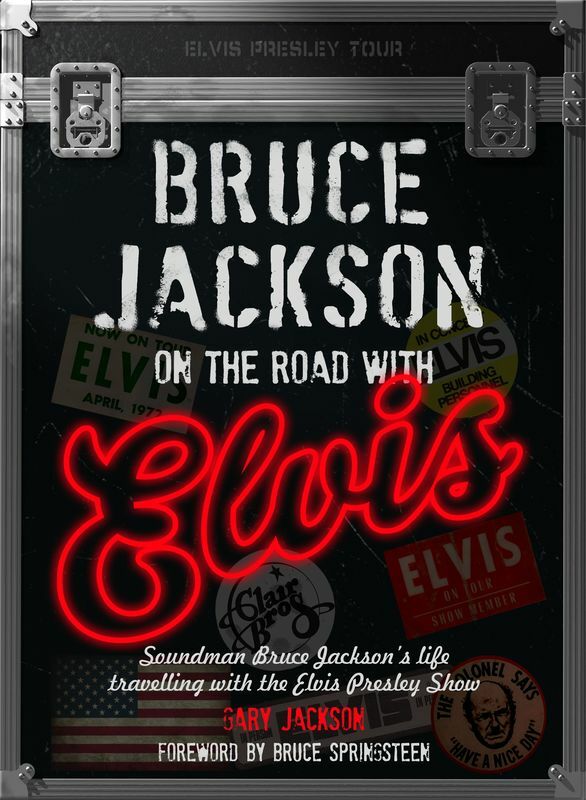 BRUCE JACKSON ON THE ROAD WITH ELVIS is now available, online only. It's a beautiful book. 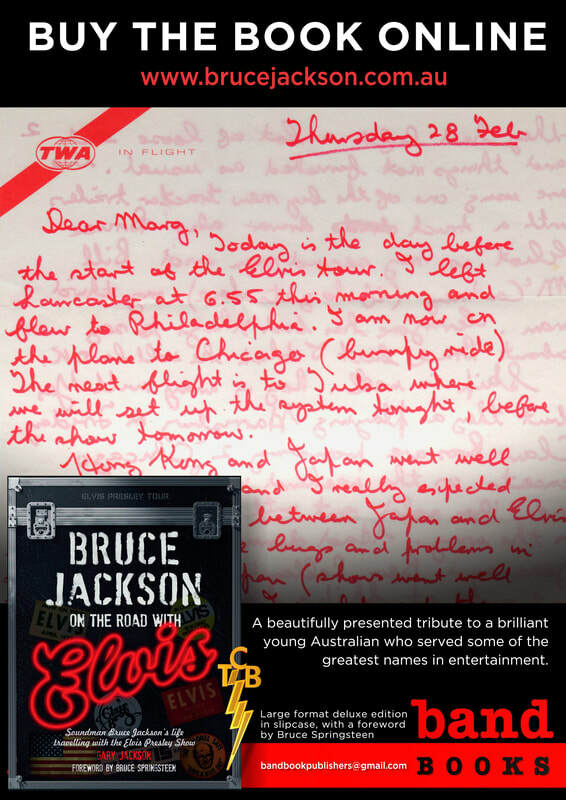 An extraordinary tribute to Bruce Jackson and Elvis Presley. 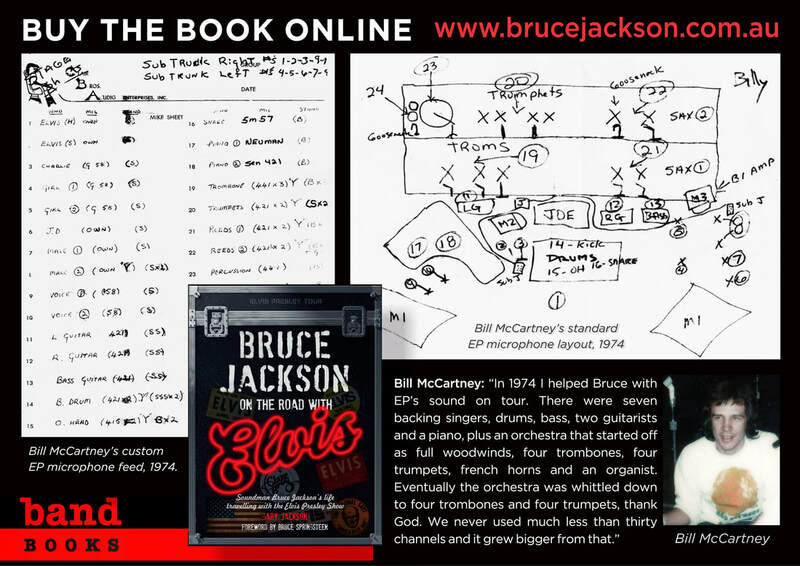 ​Bruce Jackson: On The Road With Elvis is a warm-hearted biography written and creatively directed by Bruce’s brother Gary Jackson, with a foreword by Bruce Springsteen. It details his unconventional upbringing in a castle on Sydney Harbour (run as a boutique hotel by his parents), through to the formation of Aussie sound company JANDS in the late 1960s when he was still in his teens (he was the ‘J’ and Phil Storey the ‘S’ in J-AND-S) before heading to the USA to become a live sound man for the biggest stars of the day. ​In the 1990s, amongst hundreds of other top acts, Bruce most notably became Barbra Streisand’s sound man on several tours and filmed specials, using a microphone modified with a RØDE capsule that RØDE Chairman and Founder Peter Freedman AM had custom-made for him, dubbing it the ‘Jackson Special’. First release of the entire 1976 TOUR DIARY compered by Jackie Kahane. This was a private TCB-member-only end-of- tour party. Jackie creates the impression that Elvis will be joining them - for the first time ever - but it is Felton Jarvis who turns up instead, dressed in one of Elvis's jumpsuits to the usual Elvis fanfare. Felton throws out scarves and does a brilliant job of imitating Elvis and answering Jackie's questions in character. A totally respectful tribute from the cast and crew to their much-loved boss - even Elvis's girlfriend was there and laughing here head off - but of course in the nature of roasts like this one, everyone comes in for humorous comment and the language can be confronting at times but understandable in the amongst-friends context. Remember this was forty years ago and many social attitudes from back then have now changed.